When I was there, waiting for Jasper Aston Lim and Melissa Koh, the aroma from the oven, the freshly baked scent, was killing me. I MUST EAT NOW. The thought of robbing the cakes crossed my mind. Decor: The place has a L-shaped sitting area with a bar table at the back. While the focus here is on the food, the decor could be improved, maybe have a theme? 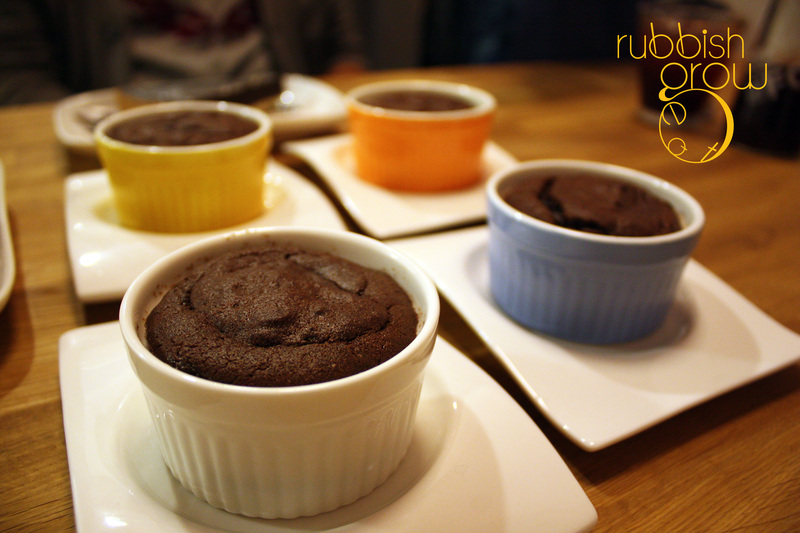 The shop specializes in molten chocolate cakes ($6.50 for non-alcoholic, $7.50 for alcoholic). 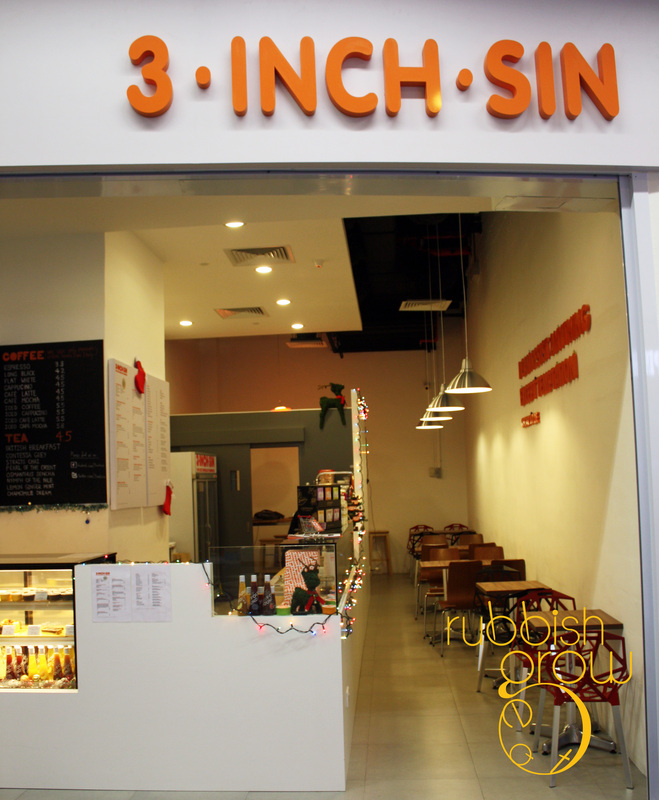 Celine, 1/2 of the owners, left her cushy job to pursue her passion. Very courageous and admirable. She was trained at Cordon Bleu and interpreted the cakes with molten middles in souffle cups. She uses 70% valrhona dark chocolate. There are 11 flavors and we tried Original, Peanut Butter, White Chocolate, Bitter Orange, Raspberry, Lemon, Cherries Jubilee and Hazelnut. We all had our favorites but strangely no one picked the Original as his or her favorites. Jasper’s favorite is raspberry and Melissa’s is white chocolate. However, raspberry, white chocolate, bitter orange and hazelnut didn’t work for me because the favors didn’t come through. This is partly because the flavors are concentrated in the center and I ate from the side (my bad). When I feedback-ed that the favors could be stronger, Celine explained that it may affect the overall taste. She knows her stuff. Don’t play play. I strongly recommend Peanut Butter, Lemon and Cherries Jubilee. Peanut butter is ALWAYS awesome, especially with chocolate; this was thick and chunky–like how I like my men to be. The Lemon was a huge surprise. Lemon and chocolate? Who would have thought? But the cake wasn’t sour, it was mildly sweet. There was a strong citrus fragrance, very refreshing. Perks you up from your afternoon lethargy. The alcoholic Cherries Jubilee came with whole cherries. There was a subtle cherry-sweetness that pervaded the entire cake and the bitterness from the alcohol added another dimension to the cake. In general, the cakes are (1) the texture was crispy on the top, but soft inside. And in the mouth, the cake felt very smooth. (2) they are not overly sweet. In fact, they are only mildly sweet, so the focus is on the quality of the chocolate. The cakes are available for take-away. Just warm it up in the microwave for 15-20 seconds. 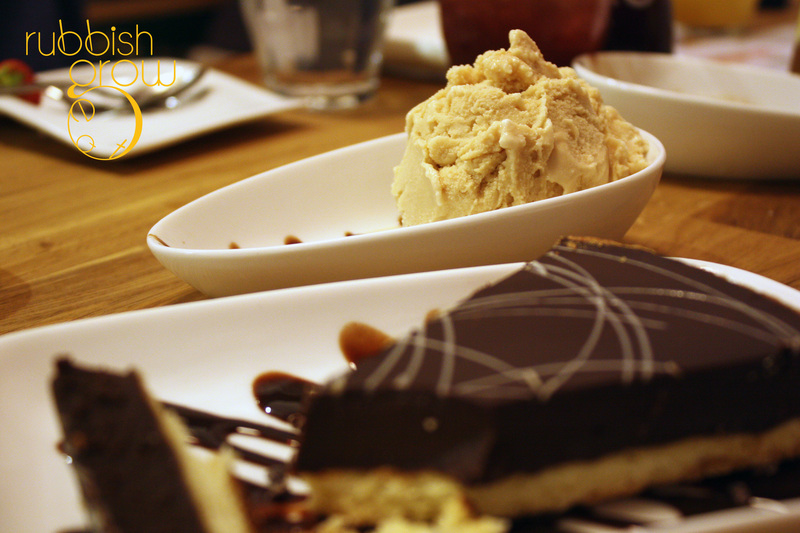 New to the menu are cakes, tarts and ice creams. The ice creams ($3.50) are customized to be less sweet so that they could go well with the cakes. There are seasonal favors so ask for them. 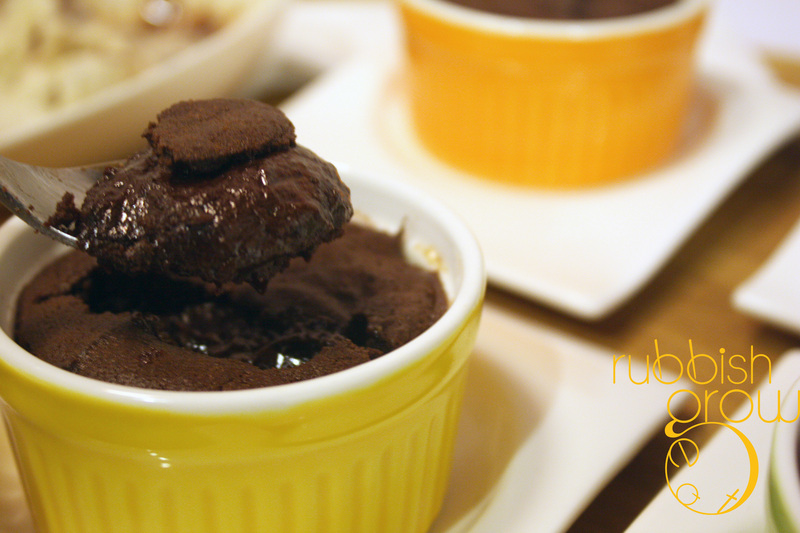 In general, vanilla ice cream goes well with chocolate molten cakes. 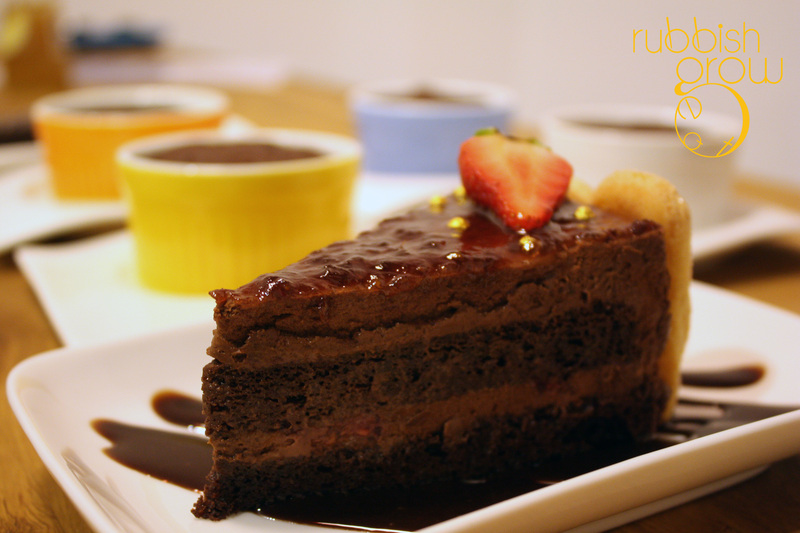 Mogador ($7) is a chocolate cake with dark chocolate mousse and chocolate sponge, glazed with–not chocolate!–raspberry. Most SIngaporeans, including me, have a predilection for airy Japanese cakes. The cakes from Celine–trained at Cordon Bleu–are more European. It was light but chocolate cakes in general couldn’t be as light as Japanese cakes. It tasted a bit like seaweed to me! Another friend tasted it too. I thought it was quite unique, surprising and fun. Perhaps there was an overdose of chocolate, so I cannot really taste the chocolateness in the Dark Side ($6), a chocolate tart. Overall, I’d still stick to the molten chocolate cakes, one of the best I’ve tasted, a scoop of ice cream, a cup of hot tea and a book on a lazy afternoon. Hey, if my hero Brad LadyIronChef Lau declares it’s the best molten chocolate cake in Singapore, it is the best in Singapore ok! ps: RERG would like to thank Kelvin and Celine for hosting and Melissa Koh and Jasper Aston Lim from Six & Seven for asking me along.